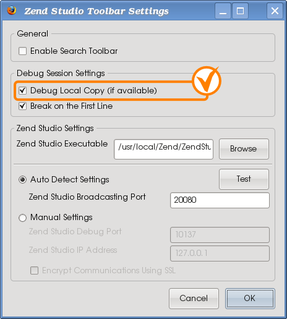 The default settings of all Zend components involved in remote debugging are good for most cases and should enable the scenario outlined above. However, some developers notice that Zend Studio doesn't hit pre-set breakpoints under certain circumstances. In 99.9% of cases there is no bug involved in this problem. As a rule, the problem is the incorrect configuration and usage. This article's aim is to describe the remote debugging principles of working, and to list the requirements for making the pre-set breakpoints work. For detailed description of GET/COOKIE parameters, see "Zend Debugger GET Request Parameters". 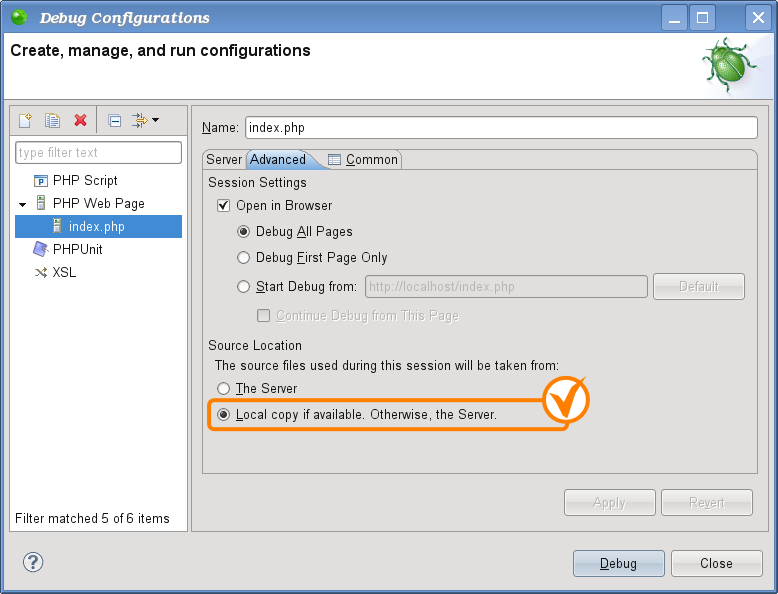 Zend Debugger is installed on the server and hooked into PHP's Zend Engine. Upon detection of relevant GET or COOKIE parameters (mainly, start_debug), Zend Debugger intercepts the script execution. 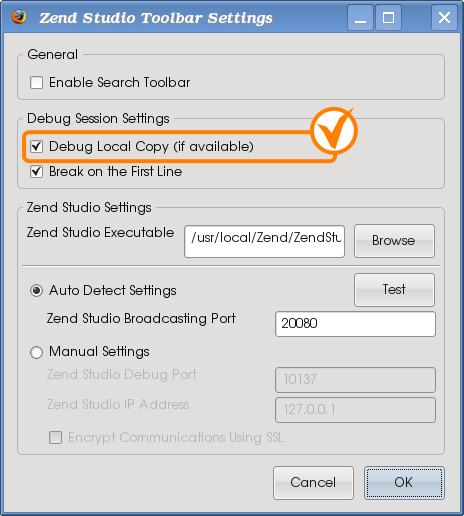 Zend Debugger "rings back" to Zend Studio on the IP address and TCP port given in GET/COOKIE parameters (debug_host and debug_port) and asks to start a debug session. From GET or COOKIE parameters Zend Debugger reads the instruction to use files from a project, rather than the ones on the server. The parameter in question is use_remote and needs to be set - "use_remote=1". Additionally, the parameter no_remote can be used - "no_remote=0". The parameter names may be confusing. However, the "_remote" part of the parameter name refers to Zend Debugger. From its point of view the files in the Zend Studio project are remote. At the end of the debug session, Zend Debugger returns command to PHP's Zend Engine, PHP returns the execution result to the web server and the web server sends the HTTP response to the original client - Zend Studio or the web browser. Excerpt: This article's aim is to describe the remote debugging principles of working, and to list the requirements for making the pre-set breakpoints work. This article also explains the remote debugging session flow and the concept of breakpoints and Path Mapping. 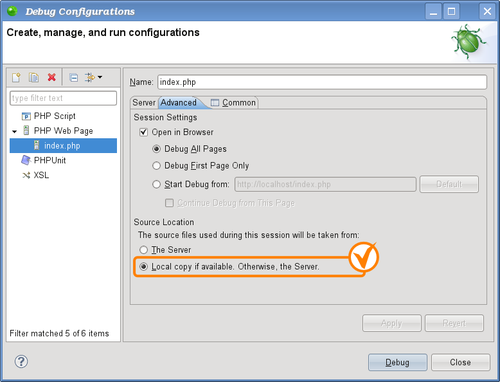 Zend Studio Documentation - "Debugging a PHP Web Page"
Zend Studio Documentation - "Debugging Using the Zend Browser Toolbar"
Zend Studio Documentation - "Path Mapping"
This article explains the remote debugging session flow and the concept of breakpoints and Path Mapping.